God’s grace has a drenching about it. A wildness about it. A white-water, riptide, turn-you-upside-downness about it. Grace comes after you. It rewires you. From insecure to God secure. From regret riddled to better-because-of-it. From afraid to die to ready to fly. 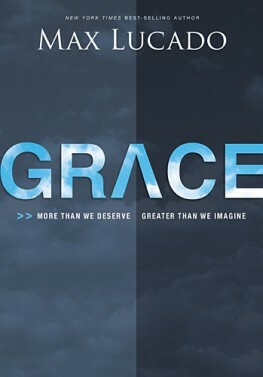 All of my life I have struggled to understand the concept of God's grace. People would speak of it, and I would nod and smile as if I understood the depths of it. But I didn't. Not really. I was really looking forward to reading this because I've read several of Max Lucado's books, and he has such an easy, genuine style of writing. That sitting across the table over a cup of tea style that I love so much. It reaches me, and I understand. Nothing drove home the idea of grace harder than the image of Jesus washing his disciples feet. Even Judas' feet. Max talks about the grossness of feet, and how Jesus stooped to wash the dirt and grime off the feet of everyone who would eventually end up abandoning him. The line that really hit me was this: "If He washes the feet of His Judas, you will have to wash the feet of yours." Max talks about how grace has happened to each of us. How our feet are soaked with His grace. He has washed the filth from our lives. At the end of the book there is a reader's guide with questions for each chapter, a grace reading, scripture review and prayer, making this an excellent Bible study choice. I would definitely, definitely recommend this book to anyone who was curious about, or struggling to understand the depths of God's grace. Available at your favourite bookseller from Thomas Nelson. Posted by Kate at 11:36 a.m.